Jacob Wohl says he doesn't know nuttin' about Surefire Intelligence, the firm tied to the bizarre Mueller allegations. 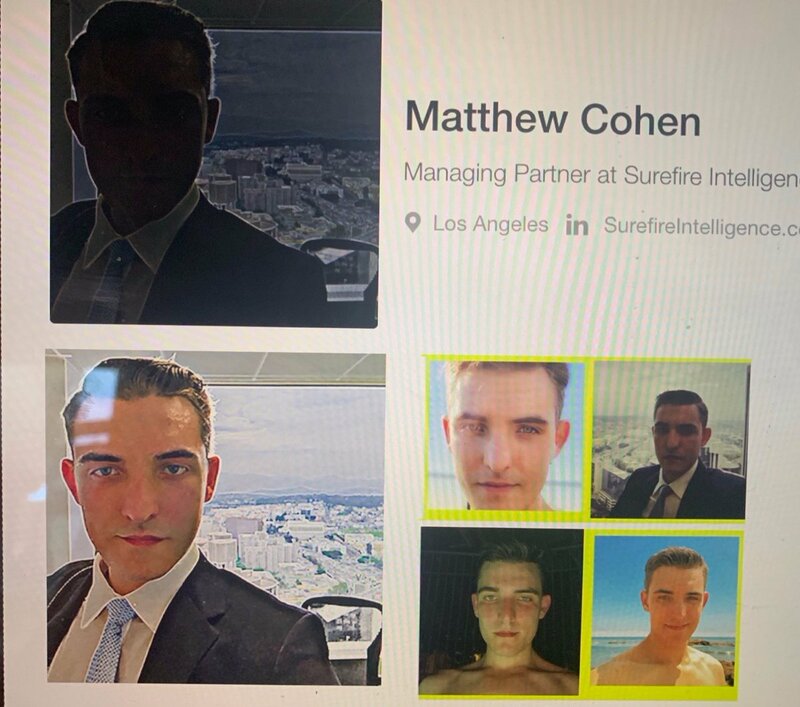 Take a look at the photos below of Mathhew Cohen, head of 'Surefire,' and of Jacob Wohl. 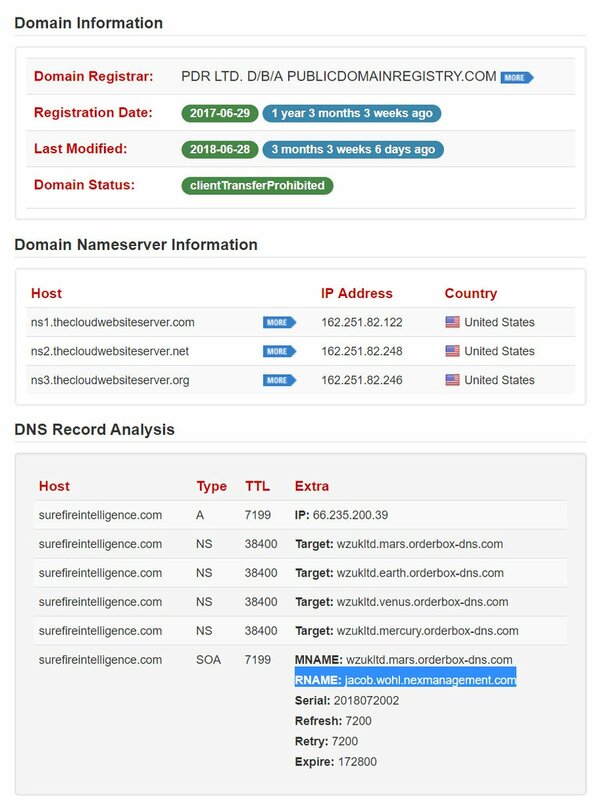 The Google storage account used for the two sites:NeX Capital and Surefire Intelligence is identical. The Jacob Wohl-linked "intelligence" firm tied to an attempt to smear Mueller used stolen photos, including headshots of model Bar Refaeli and Sigourney Weaver's husband, to make up fake staffers. DOJ charges 10 Chinese individuals, including MSS intelligence officers, hackers hired by the MSS and others, with carrying out repeated intrusions into US companies' systems, inc to steal commercial airline secrets. 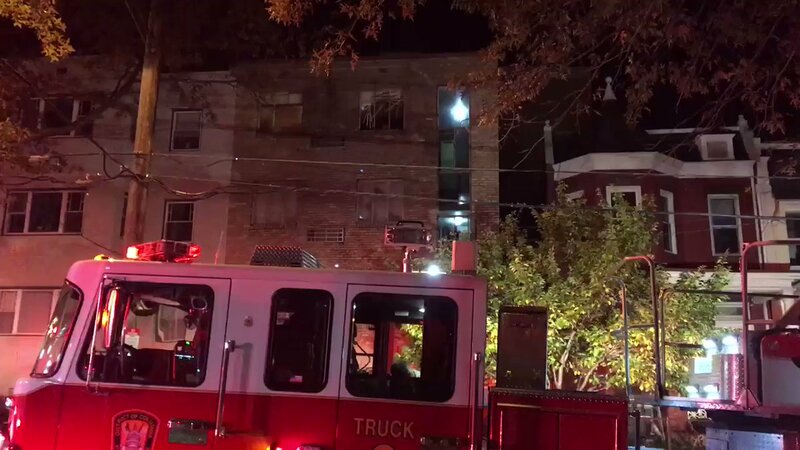 Jacob Wohl (the "LA hipster cafe" guy) is tied to the DNS records for the place that did the "investigation" for this thing. He used [email protected]t.com when setting up the site. 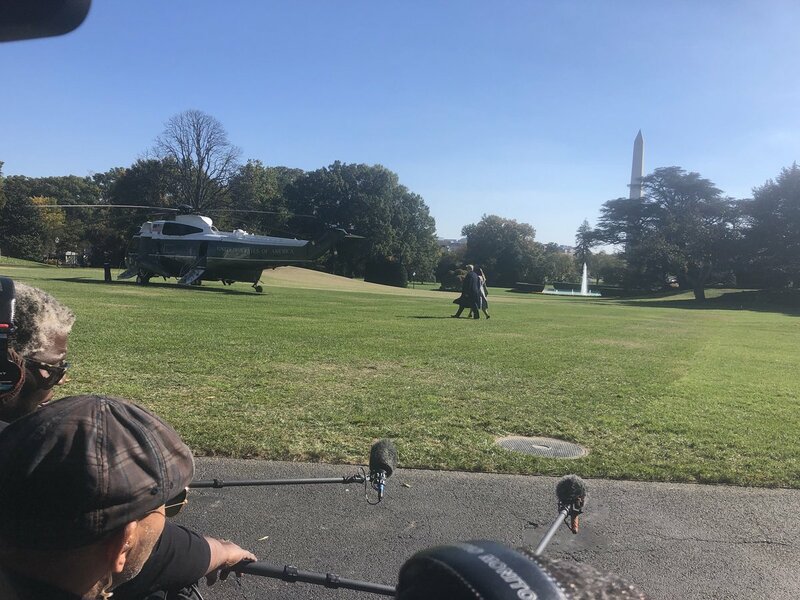 Trump leaves the White House with Melania, Ivanka, Kushner and John Kelly to Pittsburgh without giving any permission to the press. Ryan slams Trump's push to eliminate birthright citizenship: "You obviously cannot do that"
[email protected]: Congressman @KevinYoder has fought hard for the People of Kansas. Highly respected, strong on Crime, the Border, Military, Vets and Second Amendment. Kevin has my Total Endorsement. [email protected]: [email protected] will be a great Governor for the People of Ohio. He is an outstanding man who loves his State – and always produces big. [email protected]: .Richard Cordray will let you down, just like he did when he destroyed the government agency that he ran. Clone of Pocahontas, that's not for Ohio. Mike has my Total Endorsement. The Special Counsel has asked the FBI to investigate allegations that someone is trying to pay women to accuse Robert Mueller of Sexual Assault. [email protected]: Just out: Consumer Confidence hits highest level since 2000. [email protected]: "If the Fed backs off and starts talking a little more Dovish, I think we're going to be right back to our 2,800 to 2,900 target range that we've had for the S&P 500." Scott Wren, Wells Fargo. [email protected]: The Stock Market is up massively since the Election, but is taking a little pause - people want to see what happens with the Midterms. If you want your Stocks to go down, I strongly suggest voting Democrat. They like the Venezuela financial model, High Taxes and Open Borders. [email protected]: Congressman Kevin Brady of Texas is so popular in his District, and far beyond, that he doesn't need any help - but I am giving it to him anyway. He is a great guy and the absolute "King" of Cutting Taxes. Highly respected by all, he loves his State and Country. Strong Endorsement. [email protected]: Congressman Andy Barr of Kentucky, who just had a great debate with his Nancy Pelosi run opponent, has been a winner for his State. Strong on Crime, the Border, Tax Cuts, Military, Vets and 2nd Amendment, we need Andy in D.C. He has my Strong Endorsement. Executive order under consideration that would end automatic citizenship for children born in US to noncitizens, reports ⁦@washingtonpost⁩. [email protected]: [email protected]_Paulsen, @Jason2CD, @JimHagedornMN and @PeteStauber love our Country and the Great State of Minnesota. They are winners and always get the job done. We need them all in Congress for MAGA. Border, Military, Vets, 2nd A. Go Vote Minnesota. They have my Strong Endorsement. [email protected]: Congressman @DaveBratVA7th is a fighter who is doing a great job for Virginia and for our Country. Border, Military, Vets, 2nd Amendment and all else. We need Dave in D.C. He has my Strong Endorsement. [email protected]: [email protected]_Paulsen, @Jason2CD, @JimHagedornMN and @PeteStauber love our Country and the Great State of Minnesota. They are winners and always get the job done We need them all in Congress for MAGA. Border, Military, Vets, 2nd A. Go Vote Minnesota. They have my Strong Endorsement. [email protected]: Congresswoman @cathymcmorris of Washington State is an incredible leader who is respected by everyone in Congress. We need her badly in D.C. to keep building on MAGA. She has my Strong Endorsement. [email protected]: Congressman @RodBlum of Iowa got a desperately needed Flood Wall for Cedar Rapids that was almost impossible to get. He makes a BIG difference for Iowa. Border, Military, Vets etc. We need Rod in D.C. He has my Strong Endorsement. [email protected]: [email protected], @JasonLewis, @JimHagedornMN and @PeteStauber love our Country and the Great State of Minnesota. They are winners and always get the job done We need them all in Congress for MAGA. Border, Military, Vets, 2nd A. Go Vote Minnesota. They have my Strong Endorsement. [email protected]: Congressman @DenverRiggleman of the 5th District in Virginia is a popular guy who really knows how to get the job done. Really big help with Tax Cuts, the Military and our great Vets. He has my Total Endorsement. [email protected]: "You can't let these people disrupt anymore than they already have, which is disgraceful." [email protected]: [email protected] is doing a great job as Congressman from Ohio. We need him in D.C. Vote for Troy - He has my total Endorsement. [email protected]: Check out tweets from last two days. I refer to Fake News Media when mentioning Enemy of the People - but dishonest reporters use only the word "Media." The people of our Great Country are angry and disillusioned at receiving so much Fake News. They get it, and fully understand. [email protected]: CNN and others in the Fake News Business keep purposely and inaccurately reporting that I said the "Media is the Enemy of the People." Wrong. I said that the "Fake News (Media) is the Enemy of the People," a very big difference. 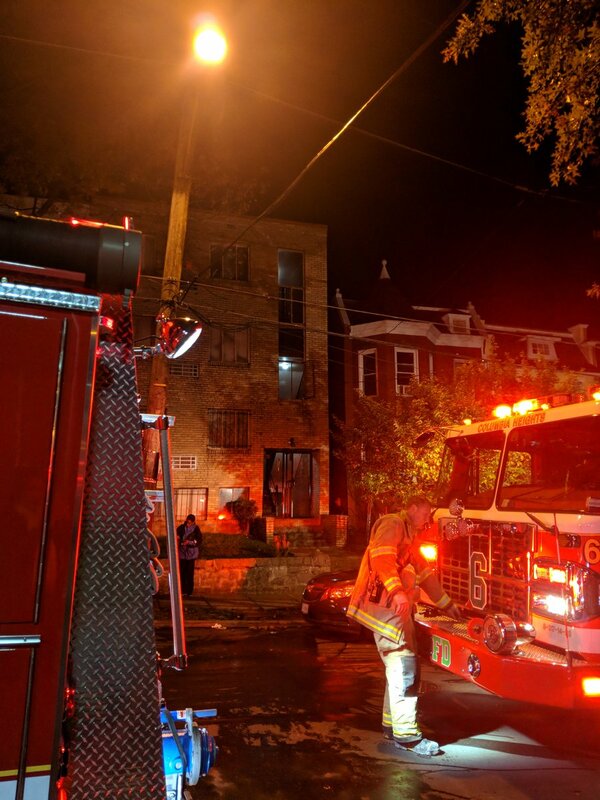 When you give out false information - not good.